I designed — and drew by hand — the STAR WARS logo. I’ve written about it in what I’d hoped was a final statement about that work. But negative gossip blabs on about this issue and about me as a person, gossip by people who weren’t there, don’t appear to know what they’re saying or why; the gossip, however, indicates that those engaged in it are likely resentful or otherwise confused about what I’ve shared, or, perhaps, just malicious about me due to various undisclosed personal issues of theirs. I can’t and am not interested in monitoring the public’s mental health but when people write hateful crud on the internet about me, particularly after I’ve taken such time and spent such effort to share information with good motives and nothing less, I take issue with it. 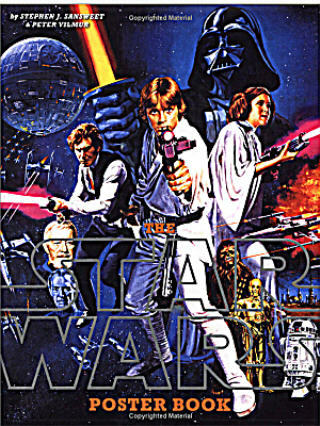 I did, indeed, draw the STAR WARS logo that has been reproduced and reprinted ad infinitum on toys, products, later Episodes of the STAR WARS saga, posters, trailers, books, websites…around the globe since 1977 with the release of the first of the STAR WARS films, “Star Wars, A New Hope” (Episode IV). How I’ve explained my thought-process, inspiration and references as to the design of the logo, seems to be the biggest source of upset to the gossipers. Since I’ve referenced a font in my explanation about the design process of the STAR WARS logo — that font is Helvetica Black — and also provided the public with the tacit exchanges between myself as designer and George Lucas as both client and filmmaker relative to that task, apparently me having shared what transpired in the confines of that period of creative development has caused certain petulant, petty and immature minds to be stuck-on-angry, spinning on their own misunderstandings and intolerance for information. Creative process is reliant upon unique solutions, but not to the naysayers who malign me, apparently. Grousing by malcontents on the internet about the credibility of my work as also the facts as I’ve shared them on my site and elsewhere doesn’t contribute one tiny bit of anything worthwhile. None of those grousers has done so much as ask me anything in email or comments directed to me, they’ve instead posted nonsense on various websites as the cowards they are. What I’ve posted on my site, however is also ACKNOWLEDGED by LUCASFILM, LTD. in their publication, “The Star Wars Poster Book” by authors Steve Sansweet and Peter Vilmur, both of whom are employed by Lucasfilm, Ltd.. Buy the book and read it, it’s in there: quotes of some of my statements about the design of the STAR WARS logo, acknowledging that I designed it. The cover of that book pictured here to the left bears a reprint of the logo that I designed and drew, after it was redrawn by Lucasfilm, Ltd. (I believe that was done by Joe Johnson) with the flat-bottom “W” and the outline emboldened — both done by Lucasfilm, so it was explained to me by Producer Gary Kurtz, to improve readability of the logo in the main titles of the film (and all the rest that followed). My logo was redrawn with some modifications but it was never replaced with a new design; or, more specifically, no “new design” was done by Johnson, he simply modified my design for predominantly production quality requirements when applied to the big screen. I can’t imagine why Gary Kurtz would call me and tell me that, had I not been acknowledged as having designed that logo…though anonymous accounts on black-field or white-field websites all question reality without regard for, uhh, reality. George Lucas knows I designed the logo — he met with me several times in the design process of the logo and I eventually handed him a finished design. What I’ve shared on my site about the design of that logo explains the process, the meetings, how it was done. It is entirely redundant to repeat that here. But on our first meeting about the design of a logo for his film, STAR WARS (later retitled Star Wars, Episode IV, A New Hope but at that time, that first release was simply titled “STAR WARS”), on our first meeting, George explained to me that he wanted a logo that “(was) very fascist.” His words, from his imagination, not mine. That was his directive to me and it was entirely theatrical in nature. If he’d asked me for a logo that was “romantic” I’d have looked into something graphically endearing and that’s how I’d refer to that directive — “fascist” as Helvetica Black similar or “romantic” as something endearing, either sans serif or not, but my words, my description, my perspective, my statement. If gossipers don’t like what I’ve expressed, well, again, so what. George’s directive continued beyond that — but not by too much — (the full story, again, is included at length here on Page 1 and Page 2 of the STAR WARS logo design story) but anyone who is seriously concerned about this and the rest of the story can easily go to the pages on this, my site, and read what I’ve written there in recounting the full story of the design process, start to finish. The directive was a theatrical one, allow me to repeat that. George and I never discussed politics, we didn’t discuss world history, we never shared in any of our meetings about the design of this logo anything about political figures, arguments or disagreements, instead, we discussed the logo design. Neither of us, to my knowledge, was involved in politics of any range at that time — I was employed as an Art Director with an education at that time in Fine Arts, Painting, and George Lucas was a filmmaker, having already completed several feature films by then. We met — OBVIOUSLY — for the purposes of designing a logo for his feature film (which was still in production at that time, I hadn’t seen it and wouldn’t until much later after the logo project was completed since the logo was used in the main titles of the film, thus, film not available until after that was completed along with the rest of the special effects). We didn’t pass labels around and discuss the socio-political nature of the world, we discussed the design of the logo. I had similar meetings with other filmmakers in the course of my work in films and film advertising and George’s directive was not outrageous in any way, nor was the meeting with follow-ups that occurred: we discussed the design work, nothing more, nothing less. The STAR WARS story is about war and peace, ego, suffering, tragedy, remarkable achievement and profound loss. George and I never discussed even those words but his directive to me as to the design of a logo for his film was that the logo be “very fascist” — he was obviously referring to his filmed saga that referred, THEATRICALLY, to an advanced and remarkable trauma of huge proportions, some of it involving warfare, all of it of the warrior-level and not of a cartoon nature but one of tragedy: tragedy as drama, intimidating graphic. Thus, “very fascist”. I can’t for the life of me understand why so many people are quite so cruel and unusual about me in this regard, why they take such outrageous task with these sparse and blatant statements. About a few of those naysayers and gossipers are these, claiming [example of this] that I “caused a big controversy on the internet” by my revealing the design process of this logo while they ignore that I was, to the contrary, responding to outrageous (uproarious, perhaps) snarks about me — if there was any “big controversy on the internet,” I certainly was and am not responsible for it. Such critics are engaged in blame-shifting. Perhaps what occurred, also to the contrary, is that a few heavy keyboard artists got very upset when they read first-hand information from me that upset their prescribed demands of spoon-fed ignorance. They read new information, it seems to have quite upset some, who then made a very big deal on the internet about how traumatized they were at reading new information…new information from me, who actually designed the logo, was a first-person participant in the process, read decades later by people with no connection to the events. And, most involved in “the arts,” especially in those socially engaged in “talking about movies” and in graphic design (includes typography) are Leftwing and socio-politically Liberal, which I am not. More than anything, I suspect that me as a Conservative who is also an artist and a creative person employed in the entertainment industry for many years seems outrageous to the predominantly Leftwing “artists” people, particularly as to films, movies, the STAR WARS saga especially. But, that’s the reality about which I’ve mentioned that some find so difficult to accept. I have my doubts. Ms Rice’s statements caused some big controversy on the web, mainly because of her claimed link between fascism and the Star Wars logo as well as the origins of the Helvetica font. Is she the real designer? (nastysmileyhere). Yes, I’m “the real designer.” And I can’t force numbskulls to understand theatrical directives any more than I can bring petulant gossipers back to good character on sites such as “typophile” (another gossiper referenced by the first gossiper above quoted) who rattles on in ridiculing me for my explanation of why I used Helvetica (actually, I used Helvetica Black and I’ve never claimed anything contrary to that) as reference upon which I drew the STAR WARS logo. We Art Directors met with, and were briefed on a visual direction for potential imagery to be developed, with either the filmmakers or distributors. Then we the Art Directors of the advertising and titling kind would go back to a drawing board and start drawing to develop concepts — we had production staff to do the actual graphic constructions and inking but they adhered to “tight tissues” as designed by me/the other Art Director I shared an office with. From all that, we’d present concepts, re-develope and re-present and continue on with that until the client (filmmaker, distributor) was satisfied. About this font-mania that the gossipers are occupied by, as to the font I used as inspiration if not reference (both visually and historically), allow me to continue about Helvetica Black. 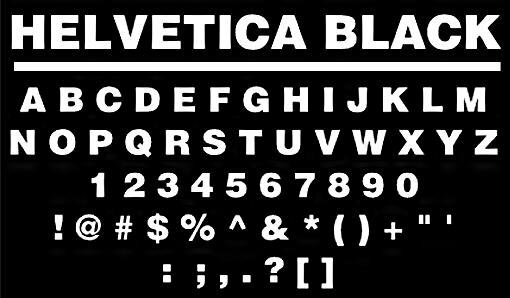 Helvetica Black is structurally forceful, dramatic of a severe nature visually, unquestionably forthright…it seemed an obvious choice for me as to where to focus when I soon focused on a blank drawing board once I’d returned form meeting with George, back to my studio. So from that font (Helvetica Black), I based the logo for STAR WARS, though what I drew was an original rendition merely BASED UPON that font as inspiration. The story I’ve shared about that font has upset a few — or, rather, gossipers — about me. From some of their gossip that I’ve read, their overheat goes something like this: “Helvetica is not a fascist font,” which is what the website, “typophile” has exclaimed as lead-in to a group-gossip occurring over there (about my writing, about the “antiquated” method of design [yikes, by hand, can you believe that], about me, ignoring even the Lucasfilm, Ltd. published history that includes accrediting me with the design of the logo). I’ve never alleged that Helvetica Black — the font, itself — was “fascist” by any specific definition, but only by atmospheric qualities, and by influence from a political time in Europe prior to it’s design, however subtle that influence later found it’s way to 1950’s and post 50’s font design period when Helvetica Black, the font, was designed. Human civilization did not start from scratch post-World-War-II, it’s existed for a long time before that and whether some will acknowledge it or not, civilization is mostly cumulative, except, apparently, for the degeneration of the gossipers on this modern, newly-found marvel called the internet. Though I earlier in life studied Fine Arts/Painting, I later also studied (University of California, Irvine) English Literature (with Biological Sciences) and learned quite a bit there about literary theory: images that originate amidst rotten politics can later be recognized as “cleansed” work and be evaluated and perceived on visual quality alone, free of the past political liabilities. It’s quite possible over time for something to possess “fascist” visual qualities and not be a representation of Fascist Germany specifically, ON VISUAL AND CREATIVE CRITERIA ALONE. 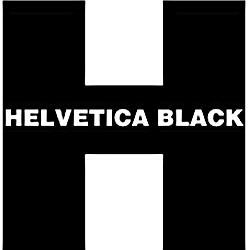 But I am sorry to have to burst certain person’s bubble, the more contemporary font family called “Helvetica” was indeed a later design with an ancestry in earlier font design in Europe, in Germany specifically. Helvetica came out of a general visual language that had brewed and developed in Europe over decades, as did font design generally from Austria, Switzerland and later, Germany. To deny this is to deny any ongoing human civilization in Europe with the conclusion of World War II and the demise of the German Socialists there. Instead, cultural influences continued on with changes, yes, but the influences are undeniable as to civilization basics such as language, how language is rendered, presented, architecture, the creative process itself in various manifestations. What I’m being criticized for is reporting the obvious. People who have some egotistical need to insert themselves in this story of this specific logo are making all sorts of irreverent if not irrational assertions about me, about what I’ve shared, about the logo itself, even so much as about how I write (about that, please read on). The lengthier rendition as told by me about my creative experience with the design of the STAR WARS logo is explained in the two pages I’ve written for that purpose. However, I cannot address just why some people (gossipers, people responsible for it on the internet or otherwise) are freaked-out about the information I presented: that font designers in Europe were influenced by other font designers in Europe and why German type design was the springboard for most of what the later “cleansed” artists in Europe designed, regardless of political influence. This is such a simple chain of reference as to be redundant-times-twenty to continue to explain or respond to as I read baseless, irresponsible accusations about me and the design of the STAR WARS logo as I’ve shared it. It’s become a case of an effort at speaking English to a barrel of minnows. Some of the wretched crud written about me on that “typophile” ninny website actually ridicules how I write (though I was never hired to write by Lucasfilm, Ltd. — the job I was asked to do was design a logo for a film, not to write about it, but, well, the gossipers continue to go nuts about how I write): the very first expose of this design project I posted on the internet years ago (and which was later replaced with a better-edited two pages) was written when I had pneumonia and was facing an hour deadline as to losing content on one server as I transferred hosting accounts to another while also holding up a transport that arrived to relocate me to a hotel for four weeks due to my flooded home. All that and there I was, trying to write the story and then quickly posted it: my plan then was to post it as whatever to get it saved without expectation that anyone would even notice it while I would later, so I anticipated, return and refine what I’d written since it was in need of obvious, considerable editing. However, I forgot about it, never returned later to edit or improve it, at least not until way over a year — actually, more like over two years — had passed. After re-approaching the content and then, at that later date, finding a few gossip sites about me having posted weirdly hysterical condemnations of my design experience (more of that by the anonymous ID people), I wrote the two pages I’ve provided links to here at this time, to replace that first awkward, badly edited version. So what had accumulated during my two-or-so-years of first posting mostly a long note during a relative emergency-hour years earlier, I discovered several nincompoops ridiculing how I write. I think back to what I was experiencing at that hour of writing that first draft/page and by comparison I can’t even feel sorry for the empathy-vacant nincompoop critics and their gossip: bottomless pit, wasteland, clocks unwound, shuffling away from Bethlehem. UPDATE: Older post removed from public view – there’s no point in allowing access to it, since the information contained in that first, original (and badly written) post is now available in my later two pages that are available here instead. As to the STAR WARS logo, if you don’t *get that* as I’ve explained it, if you just can’t believe I’ve shared things honestly with the public, read the STAR WARS POSTER BOOK and note that Lucasfilm, Ltd. does, indeed, share this same information as to me, the design, the statement from George (“something very fascist”). As to Helvetica Black, as a designer, I EMOTED an association of fonts in the context of European history in response to the directive to me by George. If anyone can’t understand how a designer “emotes” a visual, you should not be reading anything about the nature of the visually creative. Conclusion: there was no “big controversy on the internet (caused by me)”. There has been a lack of intelligence and a great deal of immaturity and irresponsibility-with-words by some other people who have the ability to host free bulletin boards and manage a website. If they don’t get it – and clearly they do not — no additional amount of contribution by me can help them. Since it was posed on that gossip bulletin board, as to gossip alleging that Ralph McQuarrie “designed the logo,” I’m addressing that here, too: he didn’t. I knew Ralph, spoke/visited with him on a few occasions (in person) and though he is was a talented artist [EDIT: RIP, Ralph McQuarrie, 2012}, he had nothing to do with the design of the logo that I designed and drew. I met and visited with him after that project was completed. I designed the STAR WARS logo, I drew it by hand. George (Lucas) knows I did, he watched it happen in stages of development and someone else, another Art Director, witnessed me drawing the logo at all stages of development. Where I derived influences to fulfill what George asked of me has been abundantly explained and most of that influence was quite intuitive. As to this alleged “big controversy on the internet,” in my experience, this is the real story: irresponsible, cowardly people write gossip on the internet about someone who they don’t know and/or about things they have no experience with and when he or she who has been targeted with this gossip responds by addressing the irregular allegations, unstable persons — whatever their individual issues may be — again assert falsehoods by accusing their target of “generating a big controversy on the internet.” To the contrary, however: when one sees a wrong and tries to right it, that’s not creating another wrong, nor is it engaging in “a big controversy” other than making a bad thing better, or trying to. Unfortunately, some people are comfortable with the bad things and changing those bad things threatens them. ©2019 suzyrice.com | Powered by WordPress 4.4.2, hosted by Living Dot | Site design customizations by Suzy Rice of a WordPress theme by Ravi Varma. by Susan Elizabeth (Suzy) Rice, author.